2 Watt Desktop Alert-Only Transmitter. Use with alert-only pagers. 2 Watt Desktop Numeric Transmitter. Use with alert-only or numeric display pagers. 2 Watt Desktop Numeric Transmitter With Telephone Interface. Connects to phone line or phone system via standard RJ-11 modular phone jack. Recordable greeting invites callers to enter a numeric message. Use with alert-only or numeric display pagers. 2 Watt Desktop Transmitter With 50 Programmable Alpha Canned Messages. 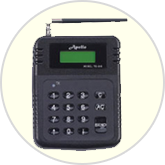 Use with alert-only or alphanumeric pagers.